I love the holidays! It's a great time to get together with family and friends sharing good food and drinks. I do have to say, there are a couple in particular that are my favorites. If you have been following me on my FaceBook page, you will know that those favorites include - Halloween, Thanksgiving, and Passover. At Halloween, my daughters and I through a Spooktackular Tea Party and invite the girls over for tea and treats! 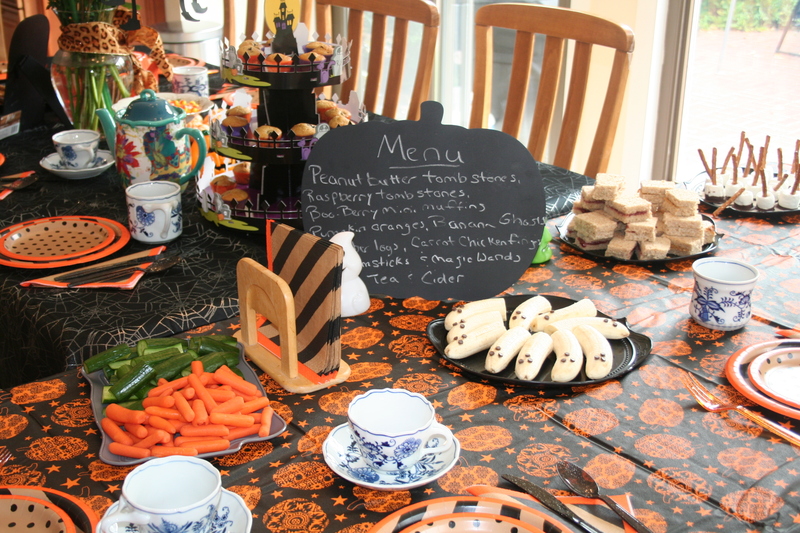 At the table, you will find Boo Berry Muffins, Ghost Bananas, Edible Broomsticks, Orange Pumpkins and Witches Brew. Thanksgiving, is a family affair. It is a holiday my husband's family and my family have spent together since we've been married around tables filled with amazing food and lots of family. In 2007 we inherited the tradition and I've been cooking up feasts ever since. Surved buffet style, you will usually find squash soup, turkey for 20, BBQ short ribs, wild rice casserol, candied yams, green bean casseral and of course my famous apple pie! I find Passover to be like the Jewish Thanksgiving in that we spend it with family and just skip the bread. I like making recipies similar to those at Thanksgiving, substituting the bread with Maztoh and adding some traditional favorites like chopped chicken liver, Maztoh brie and Chicken Soup with Matzoh Balls. I suppose I shouldn't forget about all the Spring and Summer holidays. I look forward to Memorial Day and 4th of July. For Memorial Day, friends from all over join us for an afternoon of swimming and BBQ. As the hosts, we usually provide the entree and a couple of sides, but we invite our friends to bring their favorite snacks, drinks and desserts to share. I prepare burgers, hot dogs, and marinated chicken along with a cole slaw, pasta salad and veggie tray. The 4th of July is always fun. Again, I like to BBQ and make red, white and blue themed dishes. It's usually a less involved get together, but it's still fun and we try to end the day with a trip to see the fireworks.